Recharge and power the Case Air (sold separately) simultaneously with the Tether Tools USB Type-A Male to USB Micro-B Male & USB Micro-B Female Case Air Power Split Y-Cable. The USB Type-A male connector can connect to a standard external USB power bank or a USB wall power adapter. 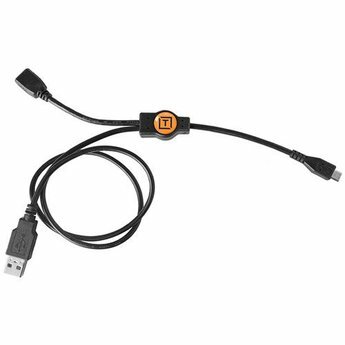 Plug your Case Air cable (sold separately) into your camera and into the USB Micro-B female port of the Y-cable. Then, you can plug the USB Micro-B connector of the Y-cable into the Case Air unit.